Sigra have developed a range of cyclonic separators for the coal seam gas industry though they could be used for a variety of other gas/liquid/solid separation purposes. These are high efficiency, compact, cyclonic separator units that are designed to take gas streams containing liquids and liquid streams containing gas and particulate matter. The two outlets produce gas and liquid with particulate matter without blockage. The units are designed to ensure that no gas leaves the fluid outlet and no fluid escapes the gas outlet. They handle sand or fines producing wells. Sigra supplies cyclonic gas-liquid separators that are capable of handling particulate matter in the liquid stream. These are high flow rate, compact, low cost devices that are designed to separate a gas stream that contains a low fraction of liquid and/or a liquid stream that contains a fraction of gas and fines or sand. While these separators are primarily designed for the coal seam gas market, they can be readily manufactured to handle other gas/liquid streams. For the coal seam gas applications these cyclonic separators characteristically have two inlets. The upper one is for the gas stream which contains droplets of water, while the lower one is connected to the pump line, which may be expected to produce gas and coal fines. The cyclonic action separates the streams into gas and water. The latter may contain particulate matter (fines/sands). Within the separator is an axial float that controls a gas valve at the top and a liquid valve at the bottom of the separator. The liquid valve shuts if the liquid level in the separator reaches a low level so as to prevent the loss of gas into the liquid take off. The gas valve is fully open when the liquid valve is shut but if the liquid level in the separator reaches a high level it closes so as to prevent the entry of liquid into the gas line. 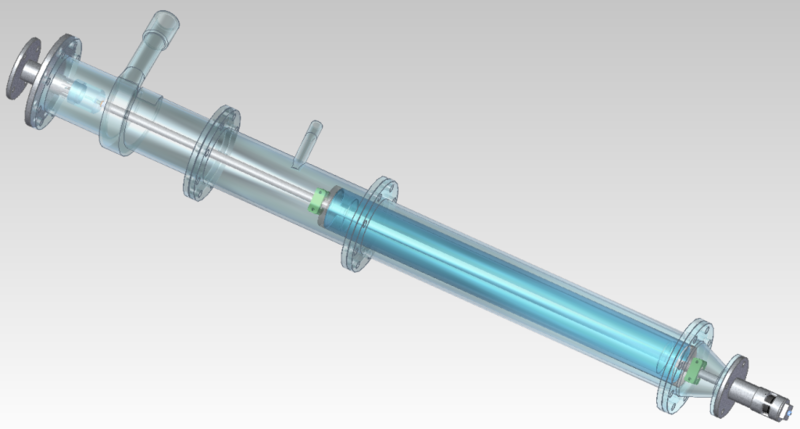 The constant rotation of the float agitates a stirrer on the main shaft that prevents any particulate matter from settling and blocking the liquid outlet. The separator has the ability to handle a liquid flow in the gas stream which may be several percent and may come in slug form. The gas flow in the liquid stream may reach up to 15%. The exact choice of nozzles for separators will depend on the flows expected, however an indication of the maximum flow ranges for each type of device is given in the table below. The normal working pressure rating of the separators is 1.0 MPa but this can be changed by making the units out of heavier pipe.